Peacock, Malibu Green, Poppy, Mac Arthur Park, Trenchcoat, Butter, Dance, Palm Springs, Rouge, Office, L’Esprit, Factory Grey, Echo Park, Hassid, Smoke Dazzle. My updated American Apparel Nail Polish collection! (But not all of them are my own, my mum picked up about 6 of those the other day, but what’s hers is practically mine ¬ ‿ ¬) As I’ve said countless times before, AA is by far my favourite nail polish brand for the colour, the consistency and how it dries super fast. I’m really excited to try out Dance and Factory Grey! haha this mirror is so cool! haha That compact mirror is genius! 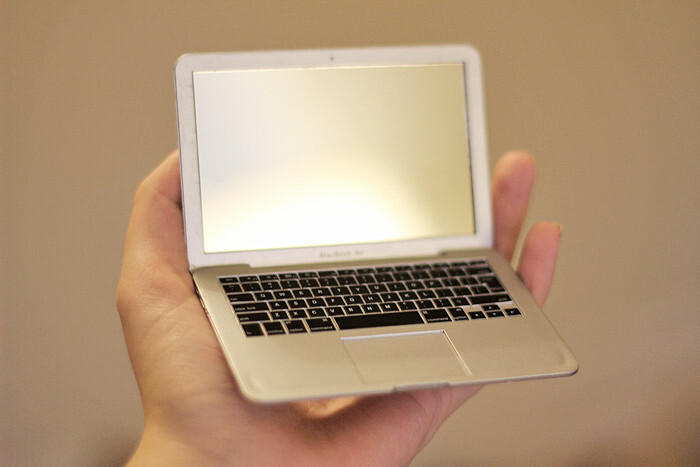 I've seen that macbook, I thought it was absolutely adorable. But also, I've never tried AA nail polish, but I'm somewhat tempted to try it now. hahah your new macbook made me laugh! 🙂 your nail polish collection is AMAZING. WHAT! The mirror is awesome, I love it. I don't even have a small mirror, need one. Also, so much AA polish, jealous. The Metallic one looks nice. wow i love that compact mirror! and the "Mac Arthur Park" nail color is my favvvvvv♥♥!